An architectural design is a technical drawing of a building. Creating of the architectural design is the important part in the architecture and building. It is a way for the architects to represent their ideas and concepts, to develop the design idea to the concrete proposal. It' very convenient for architects to create the architectural design using the computer software. СonceptDraw PRO is a powerful CAD drawing software. Using the Floor Plans Solution from the Building Plans area of ConceptDraw Solution Park you can create professional looking architectural designs quick, easy and effective. The Floor Plans Solution provides a wide set of predesigned objects, templates and samples to help you design CAD drawings of any complexity. Pic 1. 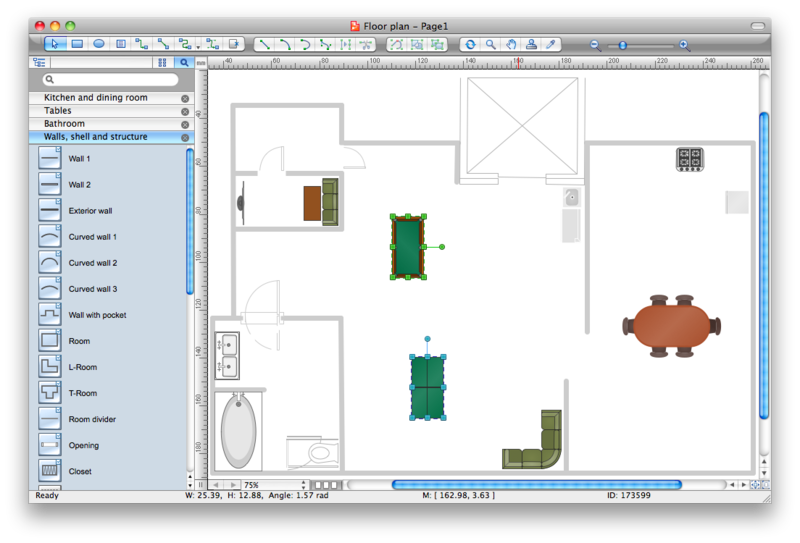 ConceptDraw DIAGRAM software for architectural design. This picture shows the architectural design of the apartment. It was created in ConceptDraw DIAGRAM using the Floor Plans Solution. The architectural designs created with ConceptDraw DIAGRAM are vector graphic documents and are available for reviewing, modifying, and converting to a variety of formats (image, HTML, PDF file, MS PowerPoint Presentation, Adobe Flash or MS Visio).